Aspen launched a new website in September that added new customer service features and makes it easier than ever for you to find the resources and services you need from Aspen. 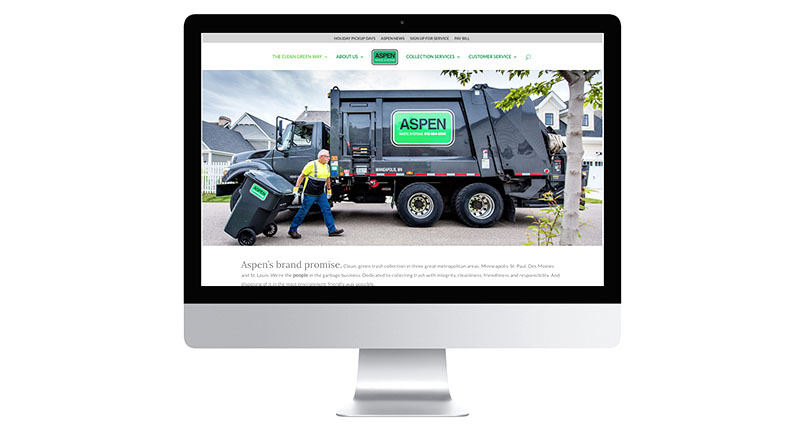 The new website extends Aspen’s superior personal service from the telephone to the computer for commercial and residential customers. Of course, you’re still welcome to call us for in-person, another-human-on-the-line responsive service. But if you prefer, you can find new resources and service request options with a few clicks on your phone or your computer. At home, at work or on the go, you can get exactly the service you need directly from our website. Find recycling information, change service, order a new container, place a vacation hold. Visit Aspen’s new website to see how easy it is. Our website also recognizes the people behind the scenes who make it all happen – The clean, green way – with photography and a video of Aspen in action. The website provides us the opportunity to connect with you, providing timely service announcements and updates. Our new website is part of our constant effort to serve you better. Let us know how you like it. It’s just another way to access the Clean, Green Way.